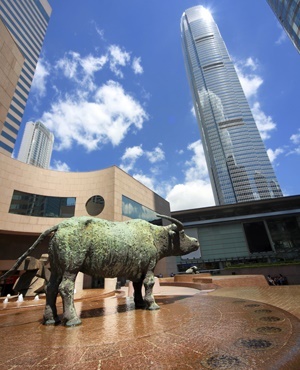 Exchange Square in Hong Kong with bull statue. Hong Kong equities rallied on Wednesday, but the Halloween spurt was never going to be enough to sugarcoat a grim October. The city’s Hang Seng Index fell 10% this month, its biggest loss since the tumultuous January of 2016. The October decline takes the benchmark’s losing streak to six months, its longest downward run in 36 years. Even the Shanghai Composite Index, the world’s worst equity gauge this year, did better in October, falling only 7.8%. The moves in Tencent Holdings Ltd have a big impact on the index because of the Internet company’s size, even after shedding more than $250bn in value since late January. This month has been a bad one for Tencent, with a global tech sell-off - the Nasdaq 100 is down 11% - adding to woes including slower earnings and a clampdown by Chinese authorities on gaming. Despite mustering a 5.9% rally on Wednesday, Tencent is still down a whopping 17% this month, its worst since November 2011. Sector peers AAC Technologies Holdings Inc and Sunny Optical Technology Co have tumbled more than 24%, the worst performers on the Hang Seng Index, which eked out a 1.6% gain on Wednesday. Tech stocks haven’t alone dragged the index lower: all but three of its 50 constituents - Citic Ltd, Bank of Communications Co and China Overseas Land & Investment Ltd - declined this month. In addition to the tech rout, stocks continue to be buffeted by factors including the trade dispute between the US and China, a sell-off in emerging markets and concern about Chinese growth. Mainland equity markets also rose on Wednesday, along with stocks across Asia. The Shanghai Composite advanced 1.4%, closing above the 2 600 level for the first time in four days. The yuan traded at decade low, a milestone it first reached yesterday.